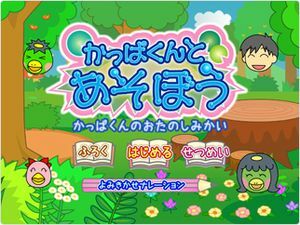 Kappa-kun to Asobou: Kappa-kun no Ota no Shimikai (かっぱくんとあそぼう かっぱくんのおたのしみかい): the second title of the Yomikakase series of picture books "Kappa-kun and Asobe" appears on the Wii!! "Pleasure of playing with Kappa-kun" is a moving picture book that makes it easy for children to get tired of parents who are busy raising their parents to work. A "Aiuei puzzle" mode for memorizing katakana is also included. Nintendo Wi-Fi connection paid service is also available, and additional material is available including Tomonori Uchikode narration by Mr. Tsunoda Ryoko. By all means, please use when playing with children. The graph below charts the compatibility with Kappa-kun to Asobou: Kappa-kun no Ota no Shimikai since Dolphin's 2.0 release, listing revisions only where a compatibility change occurred. This page was last edited on 27 January 2018, at 10:12.